Sometimes referred to as ‘otter-cats’, there is still a lot to be learnt about the elusive Jaguarundi. The Jaguarundi is a very usual cat, with a long slender body, shorter legs and a small flattened head with short rounded ears, the cat is often described as having a weasel-like appearance. Sometimes referred to as the ‘otter-cat’, the Jaguarundi is closely related to the puma. One of the smaller New World cat species, they are about twice the size of a small house cat. Jaguarundis are unusual as they do not have spots, unlike most other South American small cats. Jaguarundis are very elusive animals and there is still a lot to be learnt about the cats. Population numbers of the Jaguarundi are much less than once thought. Their shy nature makes it even more difficult to estimate their current population size. They have some of the most variable colourations of wildcats with two main groups: a dark morph which ranges from black, brownish and greys and a paler red morph ranging from tawny yellow to a bright chestnut red. For many years, it was thought the two morphs were separate species but it is now known both colours can occur from the same litter. Generally, it seems the darker morph is more common in rainforest habitats and the paler morph in drier environments. Different from many cats, the Jaguarundi tends to be most active during daytime rather than dawn or dusk. Jaguarundis are very vocal cats, with at least 13 distinct calls, ranging from a chirp, purr, whistle or even a scream. Choosing to spend more time on the ground than many other big cat species, the Jaguarundi tends to hunt small mammals, birds and reptiles from the ground. They have been seen jumping as high as 2 metres off the ground to swipe a bird from the air! Jaguarundis have very large home ranges, some males were recorded as having a range from 88-100km2! Females tend to have much smaller ranges – varying from 13-20km2. 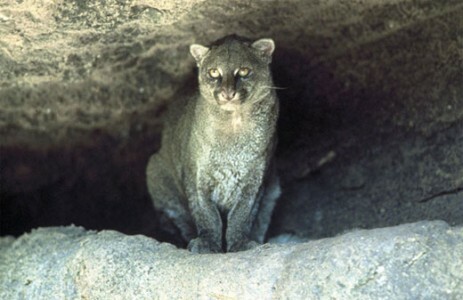 The Texan population of Jaguarundi may now only consist of a few remaining cats with habitat loss having caused an overall population decline. In parts of North America there have been some reintroduction efforts but these are hindered by the lack of scientific knowledge about the animal, their needs and behaviours. The breeding behaviour is not well known; scientists are unsure whether Jaguarundis raise cubs alone or as a pair. Females will have between 1-4 young which will remain in the den for around 28 days. The Jaguarundi are not hunted for their fur but will often still be caught in traps set for other animals such as the ocelot.